The 11th episode starts with Sung-Yeol seeing Seul-Bi and Woo-Hyun kiss and he feels upset and leaves. Mrs. Ahn talks to Seul-Bi and she tells her that she has no parents so that is why she lives with Woo-Hyun. Woo-Hyun and Seul-Bi walk home together and he wants to hold her hand and she jumps on the ledge to get away and then he holds her hand anyway. At school Sung-Yeol is angry and won’t talk to Seul-Bi and instead ignores her. During gym class they are paired and are throwing the ball back and forth to each other. Jae-Suk and his friend who punched him are throwing baseball back and forth and Jae-Suk throws it really hard. Sung-Yeol is also throwing the ball really hard at Woo-Hyun and Woo-Hyun calls him names for acting mean to Seul-Bi and throws the ball at Woo-Hyun’s stomach and Woo-Hyun doesn’t catch it. On the way to the nurse’s office Mrs. Ahn sees them and asks what happened and she scolds Sung-Yeol who is walking behind them. Woo-Hyun explains it wasn’t his fault and Mrs. Ahn asks if Sung-Yeol is also okay. Mrs. Ahn comes to the infirmary later and finds Woo-Hyun sleeping and sits and holds his hand and tears up. Woo-Hyun wakes up and questions why she is there and she says she is sorry for Sung-Yeol and offers to take him to the hospital. Sung-Yeol comes in and they ask why he is there and he says he has a headache and lies down. Later Woo-Hyun finds Seul-Bi by the sinks and they splash water at each other and Sung-Yeol also comes and they have a water fight. At lunch Ye-Na tries to sit with Young-Eun and the rest of the girls and they all move when she sits down. Ye-Na finds Young-Eun and tells her she will do anything because she doesn’t want to be alone and Young-Eun tells her to be alone and Ye-Na she will show her. Jae-Suk’s gang member the tall one picks on the cafe girl and pulls the book out of her hand and she tries to grab it back and they rip it. The guy sees Ye-Na go behind Seul-Bi on the stairs and she pushes Seul-Bi and Woo-Hyun sees everything and warns her and she teleports down the stairs and fall on Woo-Hyun. Sung-Yeol chases after Ye-Na and then sees Young-Eun and tells her she is awful for making Ye-Na push Seul-Bi. Sung-Goo is there and says that he had to use his powers. Young-Eun finds Ye-Na and she says she did it for her because she knows Seul-Bi has been around Sung-Yeol. Woo-Hyun comes and says he will never like her and Young-Eun tells her to stay away from her. The tall gang member stares at Seul-Bi and he thinks he saw her teleport down the stairs and suspicious of her now. After school Sung-Yeol sees Jae-Suk’s gang picking on a kid and he stops them by pulling out his phone camera to record and reminds Jae-Suk about the past and they let the kid go. Jae-Suk’s gang cause a ruckus outside of Woo-Hyun’s shop and so they have a game of ball and if Woo-Hyun wins they will stop hanging out at the shop. Suk-Hoon meets Young-Eun’s sister again and buys her ice cream and Suk-Hoon finds out that her mom is always working and that her dad ran away with someone else. Young-Eun shows up and pays Suk-Hoon for the ice cream and pulls her sister away. Woo-Hyun and the gang play basketball and Woo-Hyun wins. Sung-Yeol is at home and thinks that Seul-Bi and Woo-Hyun are going to be doing romantic things and wants to stop them so he starts packing and is going to stay at their house for a few days. Mrs. Ahn brings him a drink and says sorry for getting mad at him at school and he tells her he wants some food because Woo-Hyun likes it and she agrees. Sung-Yeol comes over and gives him food for rent and Woo-Hyun is mad that he wants to stay over. Seul-Bi and Sung-Yeol went out to pick up some more things and Ye-Na goes to visit Woo-Hyun at the shop and tries to make up with Woo-Hyun. She grabs him and hugs him from behind and he pushes her off. She grabs him again and hugs him and to let her hold him for awhile and Seul-Bi and Sung-Yeol come back and see the scene and Sung-Yeol takes her away. Woo-Hyun sees them leaving and goes after them. Sung-Yeol tells her it is probably a misunderstanding and she agrees so she goes back so it doesn’t get worse. At home Seul-Bi is mad at Woo-Hyun and she says she is in a bad mood and recognizes it as jealousy. Woo-Hyun and Sung-Yeol are in bed and they talk and Woo-Hyun finds out that Sung-Yeol confessed to Seul-Bi and he is upset because he wants Sung-Yeol as a friend. Sung-Yeol asks about Woo-Hyun’s necklace because he thought it belonged to Seul-Bi. Sung-Yeol goes out of the room and meets Seul-Bi and he tells her it was hard not smiling at her today and she tells him that her love won’t change so he shouldn’t wait for her. Mrs.Ahn shows the gym teacher the next day her papers for transferring to another school and he gets upset. Sung-Yeol overhears this and Mrs.Ahn and him sit down and he tells her that if it is because of him that he would rather transfer because he feels bad for liking Seul-Bi and it is a burden for her. Jae-Suk and his gang make a kid dance and Chun-Shik joins him and then Woo-Hyun walks in and also starts dancing and then everybody joins in. After school Seul-Bi gets a text from Sung-Goo to meet up for a meeting and Jae-Suk and his gang decide to follow her to find out what her secret is and use it against Woo-Hyun. Sung-Yeol leaves and he warns Woo-Hyun that he may come over at any time and stay for the night. Seul-Bi meets up with Sung-Goo and tells her they had to change the place because she was being followed. He tells her that everyone has a mark showing how long they have been human but only the transformed angels can see it. Hers will be different because she switched contracts humans will be able to see hers. He gives her a paper and tells her to memorize it. Jae-Suk’s gang watches her and see him give her an envelope and touch her hand to give her the mark and they think she is being a prostitute. Jae-Suk phones Woo-Hyun and tells him about Seul-Bi and he goes running to find her. When Seul-Bi leaves the cafe Jae-Suk’s group steals her envelope and they question how Sung-Goo knows her and he doesn’t have an answer. Woo-Hyun comes up behind the guys and takes the envelope back. The gym teacher is patrolling and comes across the scene and everyone runs away. Woo-Hyun remembers Sung-Goo from before and asks if Sung-Goo is a good guy and she says yes and he pretends not to know about him. Sung-Yeol’s dad and Mrs.Ahn went out to eat and calls him to bring his wallet. Mrs. Ahn tells him that Sung-Yeol wants to transfer and he tells her that he thinks he needs to find Woo-Hyun’s mother and she gets upset. He thinks it is because of her son in America and tells her that she should tell him to come visit and she says she wants to go home. Sung-Yeol looks for the wallet and comes across the necklace of Mrs. Ahn and Sung-Yeol recognizes it from Woo-Hyun’s necklace. 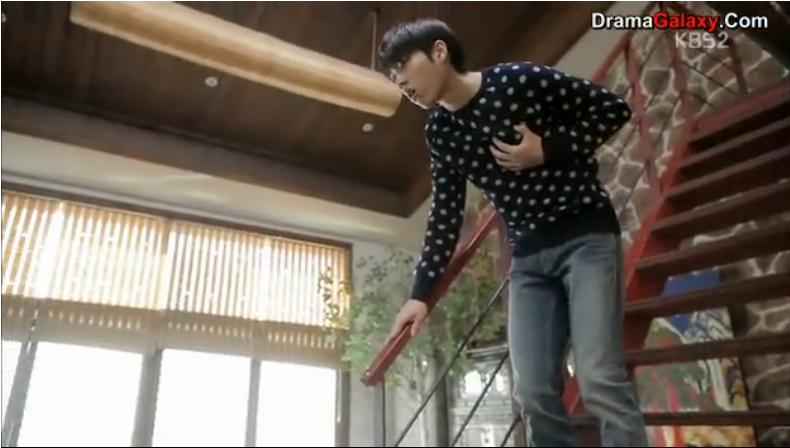 Sung-Yeol goes running over to Woo-Hyun’s house. Seul-Bi opens the note and it says when a suspicious person touches her mark she will disappear from the world and also the memories of her disappear. Sung-Yeol comes in and Woo-Hyun is taking a shower and he finds the necklace and they fit perfectly together. He pulls it apart when Woo-Hyun comes in and Woo-Hyun tries joking around and Sung-Yeol yells at him to stay away from him and this ends episode 11. Episode 11 was an exciting episode and finally someone else has figured out the Mrs. Ahn’s secret and hopefully he will expose it to his dad! Who again is soo sweet I mean he wants Mrs. Ahn to meet with her son and even offered she send her son from “America” to come to Korea to visit and of course she shuts him down though. He would easily accept her son from her previous marriage and she seems like the one that doesn’t want to have Woo-Hyun as her son. I mean she puts so much effort into a son that doesn’t even want her as a mother and yet she won’t reach out to Woo-Hyun who actually needs her. I find her mark on her arm seems kinda confusing like hers will be visible for a year but after she has passed the test? I mean how do you hide a shining light on your arm that would be very hard? unless she wears some bracelet that hides it or something? What does it mean she can’t have any suspicious person touch the mark? is that any person or do they have to be suspicious? She has to memorize just that little bit of information? lol how it that really a test to memorize like 1 sentence it seems a little strange to me? I guess Sung-Yeol is really upset that Woo-Hyun is Mrs. Ahn’s son? I mean he doesn’t seem very attached to her but maybe he is worried that Woo-Hyun is going to take over his place as the only son or something? I mean I am not sure why he is soo upset but maybe this is what worried Mrs. Ahn that Sung-Yeol would be very upset? I am very interested to see what Sung-Yeol is going to do with this secret that he has found out! The tenth episode starts with Woo-Hyun cleaning Seul-Bi’s wounds and Seul-Bi is happy that he is talking to her again. Seul-Bi wonders if it was Sunbae that dropped the pot on him and Woo-Hyun wonders if it was a ghost. Sung-Yeol made a business plan for the restaurant business and shows it to his dad and Mrs. Ahn but gets told that he doesn’t have any money. Seul-Bi and Woo-Hyun go back to school and Chun-Shik confessed to the teacher that he put his phone in Seul-Bi’s backpack and Ye-Na asks if he told and he says yes and that he doesn’t want to be a coward. Young-Eun catches Ye-Na trying to text Woo-Hyun that she put the phone in her backpack and so when the teacher comes in Young-Eun tattles to the teacher about Ye-Na. The teacher assigns Ye-Na to a duty as her punishment. Sung-Yeol and Woo-Hyun meet in the bathroom and they fight over who can protect Seul-BI and that Sung-Yeol says he is going after her too. All the girls are talking to Seul-Bi and tell her they didn’t think she did it and Woo-Hyun pulls her away. Ye-Na tries to talk to all the girls but they make her feel bad about doing that to Seul-Bi and leave her. Chun-Shik gets picked on again by Jae-Suk and his gang but he stands up to them and walks away. Jae-Suk’s gang finds a new kid in their class to pick on and tell him he is replacing Chun-Shik and to blame him. The kid finds Chun-Shik and tells him that it is his fault and that Jae-Suk told him he is going to do it to everyone in the class. Seul-Bi is in the library trying to reach the book about angel turned human and Woo-Hyun helps her and asks why she is alway giggling in class with Sung-Yeol when all the books come tumbling down and she pulls Woo-Hyun away. Seul-Bi runs out and finds Sunbae and she confronts him and he tells her she is always getting hurt because of Woo-Hyun and she tells him that he is a bad angel hurting a human. Sunbae disappears and Woo-Hyun has overheard and Woo-Hyun goes to the library and looks at the book and Sunbae appears again. Woo-Hyun remembers falling onto Seul-Bi and then realizes that he needs to pretend he doesn’t know so that she doesn’t have to go back to being an angel. The representative of angels turned human comes and drops angel books in front of Woo-Hyun and tells him that his silence will protect his love and then Sunbae drops a book on him. The rep pulls him aside and tells him that he is Sung-Goo the first angel turned human and tells him if he wants to be a human he should be one. Sunbae tells him that he doesn’t want to be human and Sung-Goo tells him not to use the cheap trick of having Seul-Bi’s identity found out so she has to go back to being an angel. Sung-Goo tells him that he is having human emotions and Sunbae denies it. Sung-Goo tells him that he needs to be hit and pulls out a rubber band and shots it and it hits Sung-Goo and tells him that it is pain and that he will take it with him and that it is love. Young-Eun leaves out Ye-Na again. In class Seul-Bi gets first place with her grades and Sung-Yeol is second. At the restaurant the phone rings and someone places a 100 servings order and she agrees and so Suk-Hoon comes and helps them and Sung-Yeol, Chun-Shik, and the girl from the cafe also comes and helps them. They go to the park and no one is there except Jae-Suk and his gang and they had ordered the food as a prank. They tell each other off and Chun-Shik throws the food at one of the goons and gets dirty. Everyone leaves and Jae-Suk punches one of his own guys. Everyone else goes and hands out the food to people around the park and tells them to come to their restaurant. Young-Eun and Ye-Na are arguing and Young-Eun is upset that Ye-Na used her and she looked bad in front of Sung-Yeol for Ye-Na’s sake. Ye-Na tells her that she has spent a lot of money on her and how will she eat now and Young-Eun goes in to punch her and Sung-Yeol yells at her. Sung-Yeol tells her that she is worst than he thought. Suk-Hoon is eating and a little girl sits next to him and he shares his food while she waits for her sister to come. Young-Eun comes and Ye-Eun the little girl is her sister. Suk-Hoon asks if Young-Eun had cried and then she pulls her sister away and leaves. At home Woo-Hyun brings a calendar and they decide her birthday will be on the day that she came here. Woo-Hyun goes and finds Seul-Bi’s angel clothing and hides it in his room so that she can’t go back to being an angel. Sung-Yeol’s dad comes and talks to Sung-Yeol about his mother getting married and that they should give her their blessing and Sung-Yeol’s gets upset and leaves. Sung-Yeol runs into Woo-Hyun and Seul-Bi and she sees a black noodle eating competition and they do the competition and she wins the prize money. At home Woo-Hyun eats the food from Sung-Yeol’s mom instead and really enjoys it. Sung-Yeol is staying over for the night because he is upset at his parents and wants to make them wait for once. Woo-Hyun takes the containers and brings them to Sung-Yeol’s dad and thanks him for the food and tells him that Sung-Yeol is staying over at his house. Sung-Yeol is having indigestion from the noodles and Seul-Bi pricks his finger. Sung-Yeol confesses to Seul-Bi and asks her to look at him and that he can wait for her because he is good at it. Mrs. Ahn gets the containers and she is upset saying to herself to try not to know each other as they live. In the morning Woo-Hyun and Sung-Yeol wake up holding each other on the floor and start yelling. Seul-Bi asks them if they are best friends and then tells them she wants to go to a sauna and they all go. They have fun eating and playing there. Sung-Yeol’s dad and Mrs. Ahn run into them at the sauna and he tells them that she is his mother and they are shocked. Seul-Bi and Woo-Hyun are in a different room and she tries to tell him that she is an angel and he stops her by blowing a bubble and pressing it on her lips and then bursting the bubble and their lips touch. The episode ends with Sung-Yeol seeing them through the window kissing. I am so happy that Woo-Hyun is back to normal and is not taking his anger out on Seul-Bi anymore! I am so confused why Mrs. Ahn doesn’t want to tell Woo-Hyun about him being her son? I mean is she really scared of her husband finding out because he seems like he wouldn’t be against it? I mean once Woo-Hyun finds out that she is his mother he is going to be even extra angry that she wanted to take care of Sung-Yeol who isn’t even her own blood but refused to take care of her own son! I mean that would be the biggest betrayal!! Also why can’t Mrs.Ahn look up Woo-Hyun’s father and help him that way so the father has to pay for the debt.? I seriously love Sung-Goo the angel human that goes and calls out Sunbae for acting like a human! I think that was the best part of the whole episode!! I secretly want to cheer for Sunbae because maybe because he seems more mature than the other boys!! I have to say K-dramas are seriously creative when it comes to kisses!! a bubblegum kiss who would have even thought of that ! it is unique! but I have to say I will remember that kiss forever it sure was memorable!! and was really cute too! !